Could Chemical Guys really make another hit with a car wash? Well they did again with this one. 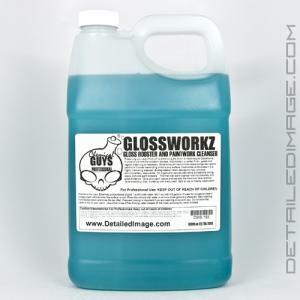 GlossWorkz is not your average prep wash like most of the Chemical Guys line. This specially formulated soap is to maintain and extend the protection of your sealant while adding a gloss of it’s own. If you want more gloss after washing this shampoo is an absolute must have! Just wash your vehicle like normal and you will be stunned by the amount of gloss it adds. Pour in only one ounce of the GlossWorkz shampoo per 4 – 5 gallons of water in your bucket and begin washing. The pH neutral shampoo will help safely remove dirt, dust and all kinds of road grime. It will not remove the coating of sealant or wax from the surface but it will enhance their appearance. It boosts the appearance and protection of any sealant or wax. If you have any kind of protection or no protection at all you will notice the added gloss on the surface. It’s totally safe to use on your entire vehicle and you’ll love how slick it feels when you use it. This is the perfect maintenance wash product in between full details. Get more gloss with just with the Chemical Guys GlossWorkz shampoo! The other important information I would like to add is that it is not a high foaming soap, rather a soap focused on the lubrication for safer washes. It has a light foam to aid in the cleaning process but with the main focus on the slickness to protect your swirl free finish. So for my maintenance washes on my clients’ cars who have already been polished, this will be my go to wash media in between light polishing and sealant applications. Now with how concentrated GlossWorkz is you get a lot of product for the price. Only 1 ounce per 4-5 gallons of water. So if you don’t have the time to wash and wax your vehicle, do a wash with Chemical Guys GlossWorkz and see the difference yourself. Been looking forward to trying this stuff out, thanks for the review! I’ll definitely be adding it to my next order. “Citrus wash” the “GlossWorkz” different?. Yes citrus wash, citrus wash and gloss, and gloss workz are different. Citrus wash is a strong paint cleaner, CWG is a cleaner with a nice gloss to its finish. Greg, do you think the “gloss” is even better than CW&G? What would you say is the difference between this new product and CW&G (for regular washes)? Are you really able to notice a difference? I’ve been using gloss workz now for several washes, I have a hard time noticing any difference vs. CWG. I personally love CWG for maintenance washes, cleaning power, foaming, and the nice gloss it gives.